(Buy more = save more). ℗ 1977 Kraftwerk. Electronic Drums –Karl Bartos ,Wolfgang Flur . Music By, Lyrics By –Hutter . Rights Society: BIEM/GEMA. Made in W.-Germany. Engineer [Record Plant] –Bill Halverson. Synthanorma Sequenzer Matten Weichers Bonn. 1 The Robots 8:56. [-NO EXTRA FOR NEXT ITEM-] Go For The Lot. 8 Abzug 2:18. KRAFTWERK COMPUTER WORLD 1981 EMI UK IMPORT CD. Condition is Very Good. The cd is in excellent condition. The jewel case has a few cracks in it. Cat#: CDEMS(WS)181. 2000 South African Pressing of "KRAFTWERK Expo 2000" CD.The disc is used. Has a few light tiny scuffs and very tiny light scratches that does not hinder play. Very well kept CD, Can see it was not played very often and handled with care. KRAFTWERK - Computer World 1. Cannily, the lyrical focus on newly accessible technology instead of cryptic futurism and vanished pasts matched this new of-the-now stance, and the result was a perfect balance between the new world of the album title and a withdrawn, bemused consideration of that world. JAPAN CD,1989' 2800 Greenline ' series reissue. KRAFTWERK Radio-Activity (1975). 10 Uranium 1:26. This is a Rare Japanese CD released in 1989. w/fold-out INSERT (No OBI). INSERT: Ex. Excellent:Few Slight Scratched,Scuffs,Slight Bit Folded(Stain) with the insert(OBI). Composed By –Schneider ,Bartos ,Hutter . KRAFTWERK - TOUR DE FRANCE 03. KRAFTWERK - THE ROBOTS. Kling Klang Produkt 2003 Ralf Hutter Florian Schneider. Producer, Written-By –Karl Bartos. KARL BARTOS - YOUNG URBAN PROFESSIONALS. Brazil RARE Press! EX(cover) / EX(cd). Pocket Calculator. More than 3 cd's, only without the jewel cases! The Robots. Asia / Oceania. Music Non Stop. Our goal is to match artwork layout and CD label appearance. If they arrive cracked we advise just buying a new one for about 35 cents and replacing it. CD Jewel Cases. CD Product Photos. What do I do if I haven’t received my order?. KRAFTWERK Expo 2000 (2000). JAPAN 5" MAXI CD. 1 Expo 2000 (Radio Mix) 3:35. 2 Expo 2000 (Kling Klang Mix 2000) 6:48. 3 Expo 2000 (Kling Klang Mix 2002) (Version 2) 5:36. 4 Expo 2000 (Kling Klang Mix 2001) (Radio Mix) 3:50. JAPAN CD,2005 ' Great 100 1500JPY ' series reissue. Excellent:Few Slight Scratched,Scuffs,Slight Bit Folded(Stain) with the insert(OBI). Very Good:Polish Marks,Many Scratches,Large Split with the insert(OBI). By: Kraftwerk. Naturally used CD. Complete with OBI. The CD, inserts, obi, and case are of course included. Yes and no. Any CD that is made in Japan, will of course be sold and intended for the Japanese market. Autor: Kraftwerk. LAND OF GROOVES. We will dispatch the product after receiving the money. We will do so too. We'll strive to resolve your problem. FOR SALE IS A JAPAN IMPORT CD OBI BY KRAFTWERK "THE MIX". IT IS COMPLETE AND IN VERY GOOD CONDITION. Kraftwerk - Autobahn CD (1974). Artist Kraftwerk. Tour de France Étape 1. Tour de France Étape 2. Tour de France Étape 3. Tour de France. Light scratches to CD. Scuffs & scratches to jewel case. Elektro Kardiogramm. Kraftwerk- Tour De France - CD -. EMI Label - 591 708 2 - Made in EU -. CD, CASE AND BOOKLET ARE IN GOOD CONDITION. 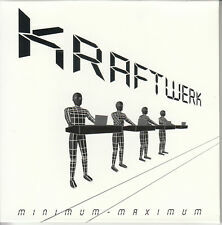 Kraftwerk CD collection.Electric Cafe.Mix.Tour De France Soundtrack.Expo Remix..
Expo Remix - CD and paperwork like new. Expo 2000 - CD and paperwork like new. Electric Cafe - CD and paperwork EX . Tribal Gathering - CD and paperwork like new. The Mix - CD and paperwork EX . only faint signs of use. (Issued to radio as a custom printed disc KW2). Tour De France 03. 1 Tour De France 03 (Version 1) 3:27. 2 Tour De France 03 (Version 2) 3:25. 3 Tour De France 03 (Version 3) 3:36. 4 Tour De France 03 (Long Distance Version 2) 7:44. The Man Machine. The Robots. Price : £13.99. Tour De France Étape 1 (4:28). Tour De France Étape 2 (6:41). Tour De France Étape 3 (3:56). Tour De France (5:10) --------------------------------------------------------. Titanium (3:21). Aéro Dynaik (5:05). EMI 724388833301. Very Good and Excellent grades may have light surface scuffs or scratches. They are all handled with care and gently used. CD and inserts and slimline case are excellent! Country produced in. (6) The Man Machine. 4) The Model. Most CD/DVD/Blu Ray are sealed by the maufacturer, however not all are. DVD/Blu Ray are made for UK market so have English as main language and are Region 2/Region B. Artist: Kraftwerk. Title: Radio-Aktivitaet-German (Remastered). Radio Sterne. Format: CD. Item Condition: New and unplayed. KRAFTWERK "AUTOBAHN" JAPAN CD CP32-5609. The OBI strip is still here. Made in JAPAN. This CD is original. Disc is EX- condition. Sleeve is EX condition. This CD sound has No noise and No skip. (EMI 0777 7 46416 2 3). KRAFTWERK - ELECTRIC CAFE. MADE IN HOLLAND. GOOD - DISC HAS MINOR MARKS THAT DON'T AFFECT PLAY. HOW MY CD'S AND DVD'S ARE RATED. VERY GOOD - DISC IS CLEAN. It all depends on which country you are purchasing from. Interpret Kraftwerk. Format Album. Genre Dance & Electronic.